Sharing a commitment to democracy, rule of law, and the prosperity and well-being of our peoples, Sri Lanka and the United States convened the second Partnership Dialogue on November 6, 2017, in Colombo, Sri Lanka. The meeting was led by Sri Lanka Foreign Secretary Prasad Kariyawasam and U.S. Under Secretary of State for Political Affairs Thomas Shannon. The Partnership Dialogue demonstrates the consolidation of cooperation between the United States and Sri Lanka, and serves to further strengthen and enhance bilateral relations in the widest sense, through regular and structured engagement. As fellow democracies, the two governments resolved to work together toward a free and open Indo-Pacific region and for greater peace and stability around the world. The United States and Sri Lanka agreed that the security, stability, and prosperity of the Indian Ocean region should be safeguarded through the promotion of a rules-based order which would ensure that all countries that enjoy the global commons respect international laws and norms. Both countries agreed to advance this vision for peace and stability regionally and in international fora and stressed the particular importance of the freedom of navigation and overflight and of maintaining a maritime order based on the rule of law including unimpeded commerce, and they shared the intention to further promote cooperation and exchanges in maritime security and safety, including anti-piracy measures. Sri Lanka emphasized its need, as an island nation, to build maritime capacity so that it can effectively patrol its own borders and safeguard its marine resources. The vision to develop Sri Lanka as a regional hub for trade and investment in Asia, which would connect trade flows among ASEAN, India, the Middle East, and Africa through free and open seas that would be the key to growth of the region, was discussed. The United States expressed its support for Sri Lanka through trade, investment, foreign assistance and direct partnership with stakeholders throughout the country. The United States remains committed to a strong economic partnership and robust trade relationship with Sri Lanka. Since the inaugural Partnership Dialogue in February 2016, Sri Lanka and the United States have made substantial progress in bilateral relations. This includes cooperation in law enforcement, counter-narcotics, counter-terrorism, and the establishment of U.S. Departments of Treasury and Justice programs to help address fiscal and debt challenges, to strengthen rule of law, and to enhance transparency. Several important official visits have taken place, including high-level U.S delegations to Sri Lanka, and visits to the United States by His Excellency the President, the Honorable Speaker of the Parliament, and the Minister of Finance and Mass Media, among others. As a sign of strong bilateral ties and deepening U.S. engagement in Sri Lanka, the United States announced it will offer a second U.S. Coast Guard cutter to the Sri Lankan Navy, pending completion of Congressional notification. The Secretary Class High Endurance Cutter will allow Sri Lanka to more effectively police its coastline and Exclusive Economic Zone and to protect its sea lines of trade and communication. The United States is also working with the Sri Lankan government to return U.S. Peace Corps volunteers to Sri Lanka’s English classrooms. The United States also announced a $21 million/3,150,000,000 Sri Lankan rupees project, awarded by the U.S. Department of Agriculture’s Food for Progress program, to modernize and strengthen Sri Lanka’s dairy sector by increasing productivity and improving milk quality, financing, food safety, and trade. The development of a Millennium Challenge Corporation compact for grant assistance for Sri Lanka will continue through 2017-2018. Both countries acknowledged the bilateral and regional strategic benefits of increased military cooperation, including the U.S. Marine Corps’ role in helping establish the Sri Lanka Marine Corps, sending Sri Lankan candidates to professional military academies in the United States, as well as several bilateral exercises and ship visits and engagements among top military officials from both countries. Sri Lanka and the United States recalled their co-sponsorship of a resolution at the United Nations Human Rights Council in March 2017, reaffirming Sri Lanka’s commitment to promote reconciliation, accountability, and human rights in pursuit of lasting peace and prosperity. The United States expressed support to Sri Lanka in the implementation of commitments as agreed in the Human Rights Council resolution, such as truth-seeking, justice, reparations and guarantees of non-recurrence, that includes providing closure to the families of the missing, and implementing appropriate reforms to enhance the professionalism of security institutions. USAID is assisting the Government of Sri Lanka in the implementation of these commitments that reflect the will of the people of Sri Lanka, through support for reconciliation activities. The commitment of the government of Sri Lanka to strengthening democracy, democratic institutions and practices, good governance, the rule of law, justice, reconciliation, accountability, and parliamentary procedures, was emphasized. The United States welcomed progress on constitutional reform, the return of private land held by security forces, and the establishment of an independent and permanent Office of Missing Persons. Bilateral security sector cooperation continues in parallel with Sri Lanka’s ongoing reconciliation, rule of law and judicial reform efforts. This also includes U.S. support for demining, joint military engagements, human rights training of Sri Lankan officers, and visits by ships and military officials. Sri Lanka and the United States shared concerns about the grave threats to global security posed by terrorist groups such as ISIS. The threat posed to international peace and security by North Korea’s unlawful nuclear and ballistic missile programs, was discussed, and the importance of all UN member states maintaining pressure on the DPRK, and the full implementation UN Security Council Resolutions, in this respect, was emphasized. The two countries noted with satisfaction the Indian Ocean regional conference hosted by Sri Lanka in August-September 2017, and agreed to continue to pursue joint initiatives that enhance security, stability, transparency and economic opportunity in the Indo-Pacific region. 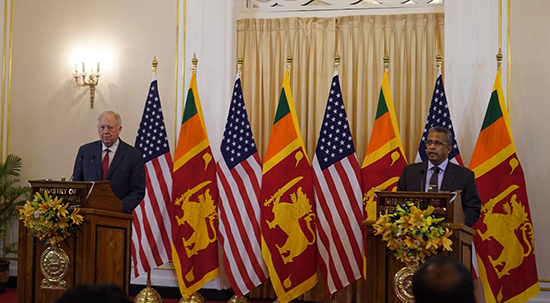 Together, the United States and Sri Lanka emphasized the importance of their bilateral relationship and expressed commitment to expand and strengthen the U.S.-Sri Lanka partnership for mutual benefit. The United States was one of the first countries to recognize Sri Lanka following independence in 1948. Both countries reaffirmed commitment to work towards increasing engagement and mutual support as the United States and Sri Lanka mark the 70th anniversary of diplomatic relations in 2018.